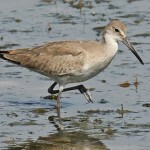 Description: Long, slightly upcurved bill; bill is orange with a black tip. Black tail and white rump. 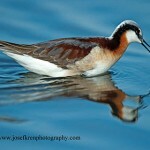 Breeding male has black back feathers with white tips; deep chestnut with fine black barring below. Juvenile is buffy all over with a darker back. Winter plumage is dark gray above and white below, with strong white eyeline. Female is larger and duller. 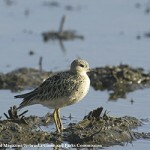 Habitat: Marshes, wet grasslands, and flooded fields are utilized by migrants. 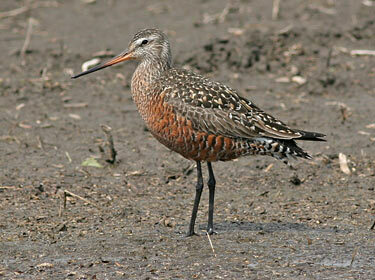 Where in Nebraska: Uncommon spring migrant in eastern part of state. Rare or absent in the west. No records of fall sightings in Nebraska. Fun Facts: Newly hatched chicks can swim across pools and slow-flowing streams. Additional Information: Species name means “blood color”, in reference to the breeding male’s chestnut underparts.